The World Health Organization estimates than 1.2 million people die in traffic worldwide. Drivers in the USA spend about five years of their lives in a car, and due to the high cost of traffic incidents, insurance has risen to about .10 per mile. Automotive Advanced Driver Assistance Systems (ADAS) have the potential to make a big impact: saving lives, saving time, and saving cost by aiding the driver in operating the vehicle, or even take over control of the vehicle completely. One of the key tasks of an ADAS is to have an understanding of the vehicle’s surroundings. Besides recognizing pedestrians, other vehicles, lanes and obstacles, the system should be aware of where other objects are, in full 3D space. This 3D information enables the ADAS to understand the distance of objects, along with their size, direction and speed, allowing it to take appropriate action. It’s common to think that us humans use our two eyes to sense depth information. At the same time though, we can easily catch a ball with one eye closed. Research has shown that humans actually primarily use monocular vision to sense depth, using motion parallax. This is a depth cue that results from movement. As we move, objects that are closer to us move farther across our field of view than objects that are more distant. The same mechanism, called Structure from Motion can be used in to sense depth using standard video cameras. There are different ways to sense depth using special cameras. Lidar measures distance by illuminating a target with a laser and analyzing the reflected light. Time-of-flight cameras measure the delay of a light signal between the camera and the subject for each point of the image. Another method is to project a pattern of light onto the scene. Capturing this distorted pattern with a camera allows the extraction of depth information. Using Structure from Motion has a few key advantages over these approaches. Firstly, there’s no active illumination of the scene required. Such active lighting limits range and outdoor use. 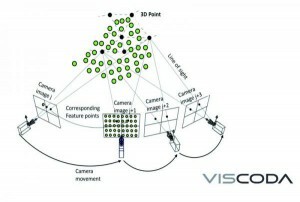 In addition, a standard off-the-shelf camera suffices, instead of a specialized depth-sensing camera. This reduces cost, since the standard rear-view or surround-view cameras can be reused, and no active lighting components are needed.